Dean Jones wrote the book on one-day cricket – literally. He played a new game in which he walked down the pitch to fast bowlers, ran frenetically between wickets and turned fielding into an attacking occupation. He was a natural showman who was for a while as popular as any other player in Australia. Yet, he was also a classic cricketer who once made a triple-century for Victoria and became their record run maker. He averaged 46 in Tests, and in the tied Test at Madras in 1986-87 played what many experts have said was the greatest innings played for Australia (210)… he ended up in hospital on a saline drip after losing seven kilograms! 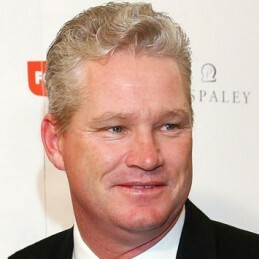 Since retirement Dean Jones has carved out a niche as a forthright commentator in the subcontinent and locally on TV and radio. Dean’s business interests have included the event management of the opening of Stadium Australia in 1999 before the Sydney Olympics that saw Australia play against the World in soccer and INXS reform for the first time without Michael Hutchence.